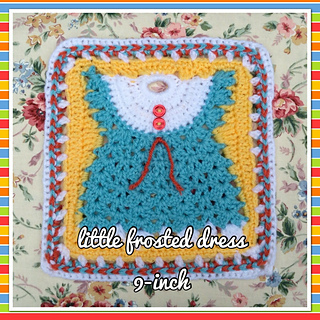 The purpose of this tutorial is to show how I went about making a 9-inch afghan square suitable for swaps, from an unusually shaped motif ‘Little Dress’ original motif design by Janelle Schlossman. Used worsted weight yarn, size ‘F’ hook and tapestry needle for weaving in ends. A couple of stitchers commented that they really like the square but wouldn’t know where to use it. The original pattern was intended to be made in cotton as a washcloth or dishcloth in the kitchen. I loved it so much that I squared it off to use as an afghan square either as one of many all decorated differently, or along with other type squares as part of a theme. Like a little girls (or big girls, lol) afghan with ballet slippers, kitties, ice cream, etc…or even in a Christmas themed afghan. Depending on the color and how its decorated it could go with a Spring blanket done in pink or yellow with flower appliques or in orange with a black yoke and a candy corn applique for Halloween. What about in white with little white pearl buttons for a pillow for a new mother of a baby girl?